I never had Fred, but I met him onboard the National Geographic Explorer while cruising from Svalbard to Russia's White Sea and then northward to Franz Josef Land. His adventures are already recounting in the log - Esther took very good care of him, and he was able to participate in many outings. My travel buddy Tigger enjoyed spending a few hours one afternoon on Cape Norwegia, Franz Josef Land with Fred the Weasel. This is very famous site in the annals of arctic exploration as it was here that Nansen and Johansen over-wintered in the 1895-96 in a small stone hut covered with walrus hide. We had it much better - Glögg and ginger cookies on the beach while we strolled around the cape. Tigger and Fred spent a little quality time together and hit off, as they are both world travelers, and rarely meet others of their size and stature. 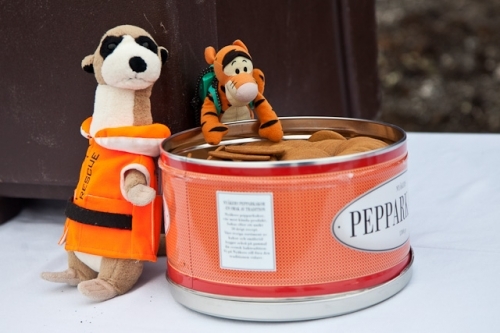 Tigger was quite jealous of Fred's life jacket, as he wears a backpack and is always a bit nervous on the zodiacs. I hope Fred continues to enjoy amazing travels around the world, and hopefully he will come to the US sometime so we can show him around. Thanks for sharing his adventures.